CardMonkey's Paper Jungle: Participating in my First "Challenge"
I needed a little egging on to get back to my paper world, so I turned to one of the many Challenges posted on a variety of blogsites. One of the blogs I follow is Emma's "My Creative Time" (click to link to the site). Emma has some very cute projects, and has interesting weekly challenges. This week's challenge called for the use of Cricut's Zooballoo cartridge for an animal-themed project. I decided to try this one out, and made this card in response. I also wanted to challenge myself not to spend quite as much time on each card's concept and production, so I set a timer. Fifteen minutes, start to finish, max. That way, I can learn to keep my quality high, but also be more productive. At the shop where I sell my cards, I cannot keep up with demand -- and it's frustrating for everyone! I used the Cricut Zooballoo letter "M" on shift-silhouette to create the monkey. I set the type using a New Font called "Scrawny" and printed out the base card on my HP printer. I used a small kiddie stack to decorate the card and trimmed with a polka-dot ribbon. I handcut the banana and peel, pop-dotting the banana for dimension, and hand-"stitching" (in ink) the peel. I placed the monkey silhouette atop of one of the paper's printed red dots. I think it turned out pretty cute! It can be used for a general note card, or as a card for a baby shower or new baby. Excellent pick on the cute monkey! I also like the color combo you chose for your card. Too Too cute. Great work! I think you did a cute card, I love it. 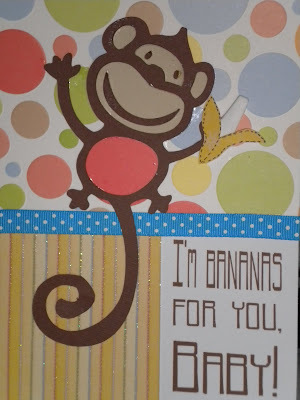 Very cute -- love the Monkey, what a sweet card. Great job. Very adorable-the monkey, so cute. such a cute little card. Love it. how cute. I am now a follower. Ellen, you did a FANTASTIC job w/your card my friend!! I appreciate that my challenge is your first! ;) THank you!